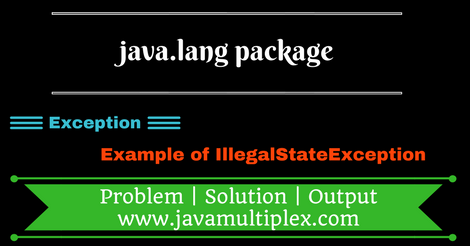 IllegalStateException is a class present in java.lang. * package and has following class hierarchy. Signals that a method has been invoked at an illegal or inappropriate time. In other words, the Java environment or Java application is not in an appropriate state for the requested operation. * element we are removing it. Thanks Kevin for your nice words. I always want to learn new technologies and share the same with other thats why I have started this blog. I feel energetic and enthusiastic if someone get benefit with my blogs thats the main point. It depends on your interest and priority. So I will suggest first build your interest in topic that you want to share and then start writing.